San Diego, Calif. — The National University System has launched an exciting new Innovation Grant Program that encourages faculty and staff to develop innovative strategies and approaches to support the exceptional student experience and student success. Following a rigorous evaluation process, 23 proposals were awarded Innovation Grants to develop projects this academic year, and the awardees recently gathered at NUS headquarters in La Jolla, Calif. to officially begin the project development process. The projects represent a range of innovative approaches that include mentorship projects, addressing veteran needs, and even looking at ways that classroom design can improve student learning. The National University System (NUS) is a network of private, nonprofit universities, including National University, John F. Kennedy University, and City University of Seattle, that has distinguished itself by offering market-relevant degrees through innovative programs. The initiative aligns with the System’s 2020 Strategic Plan, which maintains innovation as one of its core values and builds on the foundation that National University laid in 1971 when it began its pioneering work serving adult learners in new and creative formats. The Office of Strategy and Innovation is leading this initiative with the full support of the Board of Trustees, the Office of the Chancellor and the Affiliate Presidents. All parties understand that part of fulfilling the System’s nonprofit mission and vision relies on engaging its faculty and staff. 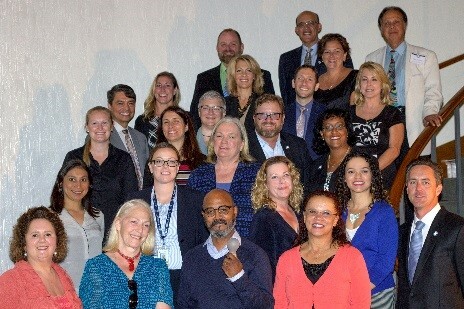 Earlier this month, when awardees from all affiliates came together for the first time, it resulted in a collegial atmosphere that fostered new relationships across the System and revealed areas for increased collaboration within the proposals. The Active Learning Classroom leverages a partnership with Steel Case Education, a furniture company that specializes in these types of classrooms, and was named one of Fortune magazine’s 2016 Most Admired Companies. The goal is to create a unique learning environment utilizing ergonomic furniture and space planning that mirrors contemporary workplace trends. Classroom design will break away from the traditional blueprint to implement more welcome and engaging layouts, such as “arena” or “digital playground” to increase student engagement and performance. ACCELERATE is designed to promote academic success among our veteran students as they transition to civilian life. A quarter of National University students are current or former military, and the University remains steadfast in its commitment to one of its founding principles of serving the military community by delivering specialized programs, scholarships and resources. The plan proposes more events to bring these students and their families together with other students and members of the faculty and staff. This plan seeks to ensure our classrooms are accommodating to military and veteran students by increasing military cultural competencies among faculty and staff. Center for Advanced Technology is unique in that it engages multiple System affiliates, combining efforts of faculty, staff, students and alumni. The development of an advanced technology center encourages university students and alumni to serve as mentors for students in one of NU’s charter high schools in the fields of science, technology, engineering and math (STEM). This level of student engagement and applied learning has led to higher test scores among high school students. Together, these university and pre-college students will demonstrate their work in cyber-mechanics through capstone projects, and community STEM fairs and competitions. Professional Development for Lifelong Success outlines a plan to deliver professional development workshops to current students. The workshops, co-facilitated by faculty and alumni from the School of Business and Management, will enhance workplace readiness by focusing on lessons in leadership, team building, communication management, and more. This program is one of several that has the potential to expand system-wide. As this is a first-time initiative, the Office of Strategy and Innovation was thrilled to receive nearly 70 creative proposals focused on next-generation learning and enhancing services for students. The project lead for each proposal was required to be a full-time faculty or staff member, however, employees at all levels have joined these projects. As demonstrated in some of the plans mentioned above, the grantees have been encouraged to engage students and alumni, and work with colleagues across the System. The Innovation Grant Program will help us learn and scale best practices, as we continue to develop services that keep the National University System a network of distinctive, leading-edge universities. For more information about the Innovation Grant Program, please contact the Office of Strategy and Innovation at strategy@nu.edu.